Join the discussion on our forums! 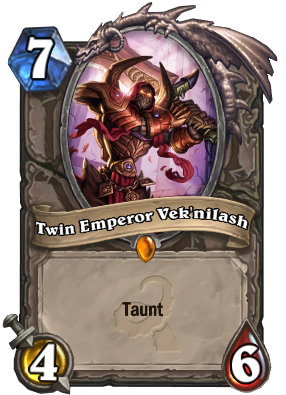 Come discuss Twin Emperor Vek'lor over in our dedicated Twin Emperor Vek'lor discussion topic. Do they make decisions based on age? "I'm two minutes older therefore we burn this village." I want to craft his twin. What a great legendary card in general. Best death sound in game. I need this card so badly for my C'thun deck! 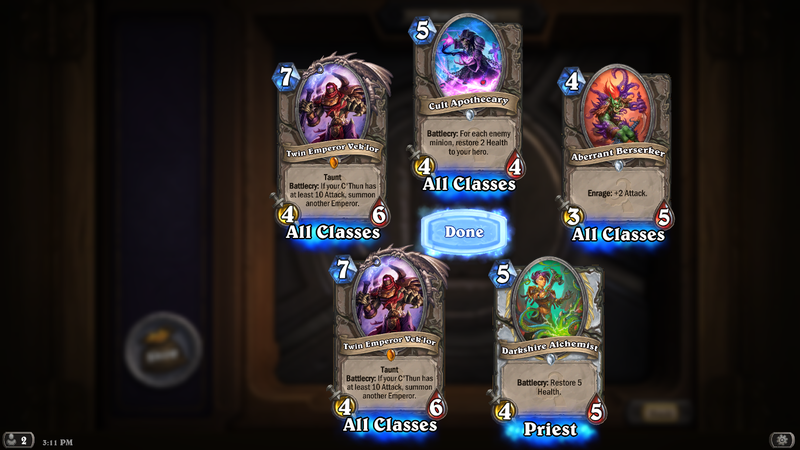 1 battlecry = double value of dust. 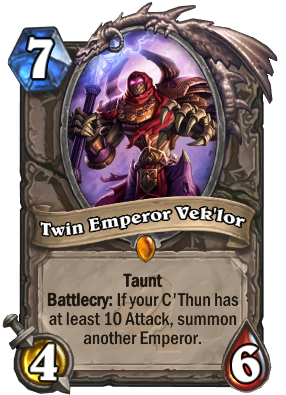 As boring and flat as I find C'thun, this card is for sure OUTSTANDING 7 mana 8/12 body between two taunt minions?? I have played three games and they put up a huge wall for trades, or gets rid of hard removal 9/10. I dusted this, thinking I'd never want to play a C'thun deck.... feels really bad lol. Every C'thun deck is budget until you add this card into it. Not going to lie, but I really think it was a missed opportunity for "Prepare for Trouble!" so when it dies will it say "twin emperors BLASTING OFF AGAIN"? Go ahead put it in a deck. 50 games in counting and I have never see it in my hand. Maybe vs mil rouge it will be the last thing you draw but this is untested. That only suggests whatever deck you've been playing has a bad card draw mechanism, doesn't say anything about the card itself.